In the middle of February we had a few bright spring-like days which enabled us to do a bit more weed clearing - the biggest problems being couch grass, bindweed and brambles. Much of the bindweed and bramble is deep rooted so it will be a recurring problem and just a question of constant vigilance and control. And the Luz de Otono broad beans are showing through. I haven't tried Luz de Otono before but they are a variety of aquadulce which is cold resistant and suitable, therefore, for November/December sowing, but they are supposedly good for late spring sowing to produce autumn crops, hence the name. So if I have space, I will sow some more in the spring. Although the soil is still fairly wet and heavy, we did manage to do some clearing and preparation to plant 4 gooseberry bushes acquired from neighbours and we have a further two which need transferring from our old plot at Mile Oak. We have also cleared a space to transplant 9 blackcurrant bushes from Mile Oak. Our biggest challenge will be to try to transfer two red currant bushes which I fear will be too deep-rooted to move. It was a struggle transferring them from Belvedere to Mile Oak some years ago when they broke the garden fork! Another challenge will be moving a plum tree which was newly planted at Mile Oak about 18 months ago but now looks well established. It's too early to think about most sowing yet but I will try some aubergines in the conservatory at home and try to bring them on in pots before transplanting outdoors in July. I have started chitting the potatoes too. I started off some Charlotte, second earlies at the beginning of the month but have now bought some Nicola, also second earlies, which did so well at Mile Oak last year. If the weather improves, I will start planting in March but just as we thought spring was on its way, the weather has turned and Storm Doris has arrived! A double hernia operation just before Xmas and an eye operation in January have delayed some essential work and the amount of rain hasn't helped in enabling us to prepare the soil for planting and there is still a lot of weed clearance and digging to be done. We have almost cleared a patch, however, to transplant our blackcurrant bushes and two gooseberry bushes from Mile Oak and we need to find space for two more gooseberry bushes donated by a Weald neighbour. And the double row of Luz de Otona sown in December is just showing through. I have now sown a double row of Giant Exhibition. The shallots planted before Xmas are showing through and I have just planted two rows of a later variety, Jermor. The garlic planted in December, is also going great guns. As digging in the very wet soil is difficult, I took the opportunity to top-dress the blueberries with a rich ericaceous compost. I am growing them in pots because they don't like the South Downs chalky soil. - but that's deceptive as about two-thirds remains to be cleared. Apart from transplanting the fruit bushes, preparing the ground for the early potatoes is the next priority. And whilst I've been weeding and planting, Sylvi has made great progress in clearing all the weeds and brambles from the far end and building a fence with pallets - it's still a work in progress, but looking good. Sylvi has also made a great start on clearing and preparing the site for our shed. The footpath to the left is the boundary of our site and was laid by our neighbour. We are just hoping for a few dry weeks - fingers crossed! We went a bit over the top with garlic planting towards the end of 2016. I had bought two varieties from the site shop a white one and a purple one Provence Wight and Purple Wight but I had also ordered varieties from Sutton's which included Edenrose, Printanor, Germidour and Messidrome. The Germidour is also known as Purple Wight. So we have 5 varieties to see which do best on our soil and in our climate (and rather a lot left over which has gone to Luke at Neville and one of our neighbours at the Weald, Steve). I had also bought some shallots – Griselle - for autumn/winter planting. We made a quick visit to the site in January to see how things were progressing and were pleased to see that the shallots were beginning to sprout although a few had been dug up and had to be replanted. I'm told that birds mistake the growing tips for worms and pull them out and then leave them when they find they are not. I have covered the beds with some plastic mesh as a temporary precaution until they get rooted. The garlic also seems to be progressing well. We attempted some digging to clear a patch to transfer our blackcurrants from Mile Oak but the ground was too wet for any serious digging and weed clearance. The Aquadulce broad beans planted in October/November are doing well and I also planted a double row of another variety Luz d'Otona just before Xmas. Sylvi has made great progress in building a fence with old pallets at the end of the allotment and clearing a space to site the shed. We need to get team shed together soon! November was a month of frenzied activity. I managed to sow a double row of Aquadulce broad beans in the last week of October and a second double row a fortnight later. The first sowing were up by the middle of November and the second just showing by the end of the month. 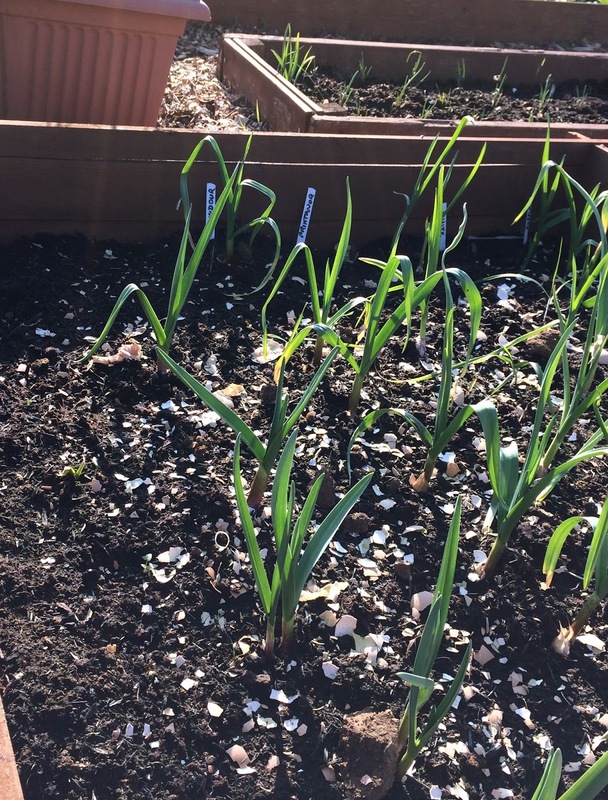 We began to move some of the other raised bed frames from Mile Oak and have planted some shallots in one and several varieties of garlic in another. It's a constant battle to keep them planted as some bird or animal keeps digging them up. I am told that some birds see the tip peeping from the soil and tug at it, thinking that it's a worm, and then discard it. I have remedied this by laying some plastic mesh over the shallots and resting an old pallet on the bed with garlic. I will uncover them in December to see how they are progressing. We now have a variety of frames for raised beds from the old allotment and I responded to an offer on Streetlife - for wooden planks. They turned out to be slats from an IKEA bed, but they have made a useful small raised bed which I may use for herbs. We also acquired some wooden pallets and several planters free on Streetlife and Luke has provided us with several more pallets with which Sylvi is building a fence. The Weald is a very friendly allotment site and feels like a real community. People have offered to help, lend us things and our immediate neighbour has already supplied us with green salad and Jo, on the opposite plot, offered us a shed which was no longer needed! The only problem was that it needed dismantling and re-erecting! With an army of helpers, Charlie, Terry & Anita, Bradley and Luke (with extra assistance from Jerome), the demolition and move on to our plot was achieved relatively painlessly and it is now piled up in pieces awaiting a site to be cleared and levelled. It had no floor but was resting on pallets!